Remembering Bandleader And Producer Johnny Otis Bandleader and producer Johnny Otis, who launched and then nurtured the careers of many of R&B's greatest singers, died Tuesday at his home near Los Angeles. He was 90. Fresh Air remembers Otis with excerpts from a 1989 interview. 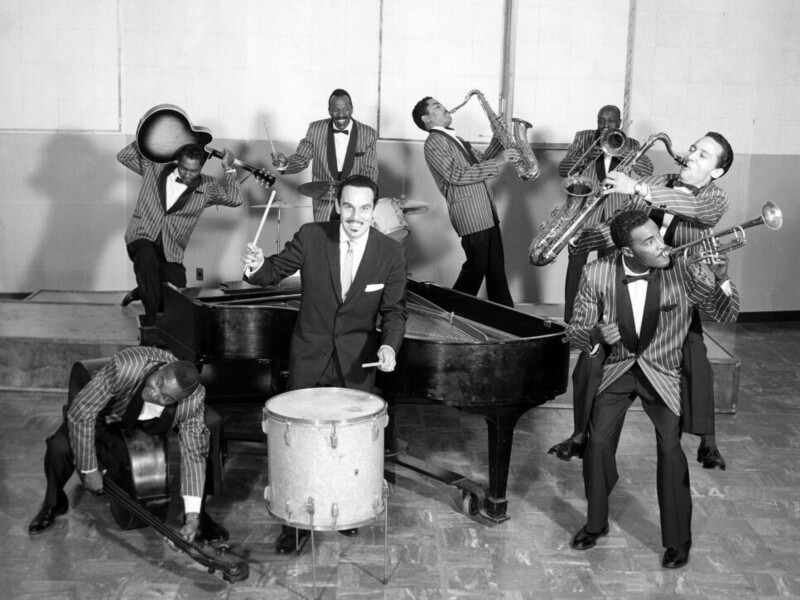 Johnny Otis (center), shown playing with his band The Johnny Otis Revue. Bandleader and producer Johnny Otis, who launched and then nurtured the careers of many of R&B's greatest singers, died Tuesday at his home near Los Angeles. He was 90. Otis started out in the 1940s, leading a big band that scored a hit with its 1945 jazz recording "Harlem Nocturne." That group, like many big bands, soon broke up for financial reasons. After that, Otis organized a smaller unit, which played a hybrid of swing and blues that became known as Rhythm & Blues. Otis' Rhythm & Blues Caravan became the first R&B touring road show. Through his nightclub, his talent shows and his road show, Otis discovered singers such as Etta James, Little Esther, Jackie Wilson, Big Mama Thornton and Hank Ballard. Otis was also an accomplished musician who sang several hits, including "Willie and the Hand Jive," which made it to the Top 10 rock 'n' roll chart in 1958. But he spent more time helping singers establish their own voices and develop their own hits. In a 1989 Fresh Air interview, Otis talked with Terry Gross about touring as a musician with some of the biggest black acts of the 1940s and '50s, including Louis Jordan and Bill Kenny and The Ink Spots. "Both of these people were so popular at the time that there was the same feeling that you feel when the curtain opens — that great anticipation," he said. "We were lucky enough to be the band." Many audiences assumed Otis, who was a white Greek-American, was actually a light-skinned black man. While touring in the South, he said he never disabused anyone of that notion. "In those days, many of the places we played — had they suspected I was white, we would have been arrested," he says. "Your life was on the line. When our bus would cross the Mason-Dixon line, a pall would fall over the entire show. Because we knew we were down there where we had problems." Otis recalled one incident, when he was traveling with the singer Little Esther, now known as Esther Phillips. Phillips, who was only 13, stopped to use a restroom at a gas station. "I looked up, and there's a guy with a gun in my belly, and he's shaking and he's all excited because the little black girl went to the white woman's bathroom," he said. "And I thought to myself, 'Any death but this.' But she came out and we went on down the road. But those things happened to us all the time." "My first singer was Ernestine Anderson when she was just a little girl. And then came Esther Phillips. But after Esther Phillips' amazing success — after she became a big child star of the African-American community nationally — then, everywhere we played, people would bring me their sons and their daughters backstage. I guess they figured I was an expert who knew how to make stars out of kids. That's how it started." "I learned quick. They would come in and say the same thing — I don't care if I was in Mississippi or Massachusetts — they would say, 'Mr. Otis, now we know that you know if junior has any real talent then you'll tell us the truth. And if he doesn't, then—' But they didn't mean that. What they meant was, 'This is the world's answer to the great child star. This is it.' If I would dare to suggest they weren't, then I'd have an enemy on my hands. So I learned how to sidestep that and tell little fibs." "What a strange thing has happened as the years went by. The roles reversed. Today, our audience for blues-oriented music is white. And the black youngsters are not interested in it, and is something that pains us for many reasons — not just personally, but when you start to think from a cultural standpoint, how much we seem to have lost over the past 20 years or so in the African-American community, where blues and jazz artistry is concerned."